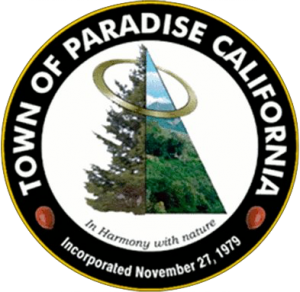 PARADISE CA – A major milestone in recovery after the Camp Fire is being reached this week, as the Town of Paradise prepares to issue its first building permit after the November 8, 2018 Camp Fire. On Thursday March 28, 2019, the Town of Paradise Building Division will issue the first permit to the Buzzard Family to rebuild their home which was destroyed by the Camp Fire. The Camp Fire, now known as the most destructive wildfire in California history, destroyed over 11,000 homes in the Town of Paradise. Many residents of Paradise have been anxious to begin rebuilding as soon as possible, and now as lots are being cleared, permits will begin to be issued with increasing frequency. Residents can submit their plans now, and permits can be issued once the lot is cleared and soil testing is certified clean by Butte County. The Town of Paradise has hired additional contract Building Division staff to help with the increased number of permit applications that will be received in the coming months. “This first building permit is a sign of the resilience and perseverance that our residents have in coming back to Paradise.“ Says Paradise Mayor Jody Jones, “ I look forward to many more! Meagann and Jason Buzzard, both life-long Paradise residents, are looking forward to rebuilding their home and helping bring some normalcy back to the Paradise community. “Receiving our building permit is a giant step towards rebuilding our life in Paradise. Thank you to all of the companies and individuals who helped get us to this point. This was not an easy process, however being persistent and having a positive attitude is what helped our family get to this first milestone. “ The Buzzard family will pick up their building permit at 3:30 pm on Thursday.